Here or coming soon to Leeds Libraries, definitely worth a read!!!! The Valley of Amazement by Amy Tan In fin de siecle Shanghai, Violet Minturn grows up at Hidden Jade Path, the city’s most exclusive courtesan house. But when revolution comes, she is separated from her mother and forced to become a ‘virgin courtesan.’ Both Chinese and American, Violet moves between these cultural worlds, becoming a shrewd businesswoman who deals in seduction and illusion. But her successes belie her private turmoil. 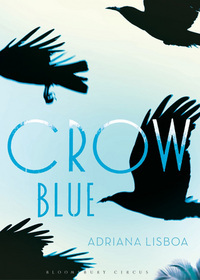 Crow Blue by Adriana Lisboa When her mother dies, 13-year-old Vanja is left with no family and no sense of who she is, where she belongs, and what she should do. Determined to find her biological father to fill the void that has so suddenly appeared in her life, Vanja decides to leave Rio de Janeiro to live in Colorado with her stepfather, a former guerrilla notorious for his violent past. From there she goes in search of her biological father, tracing her mother’s footsteps and gradually discovering the truth about herself. The Pure Gold Baby by Margaret Drabble Anna is a child of special, unknowable qualities. She is happy, always willing to smile at the world around her, but she also presents profound challenges. For her mother Jess, still in her early 20s, her arrival will prove life-transforming. Over the course of decades, in ways large and small, Anna will affect the lives and loves of those around her. While Anna herself will remain largely unaltered by the passing years, she will live through a period of dramatic change, her journey illuminating our shifting attitudes towards motherhood, responsibility and the way we care for one another. The Love Object by Edna O’Brien – Spanning five decades of writing, ‘The Love Object’ takes the most memorable and successful stories from collections like ‘A Scandalous Woman’ and ‘Saints and Sinners’; stories that have bewitched generation after generation. Here you will find stories about families, feuds, love and land, enchantment, disenchantment, and throughout, the manifold bonds of love.